Protect your family with a higher standard of filter than the original or other cheap compatibles in the market. Our filters come with lead, asbestos and cyst removal. Normally most compatible filters just remove chlorine, taste and odor but our filters have enhanced filtration capability on mechanical materials such as lead, asbestos organic bacteria and cyst. 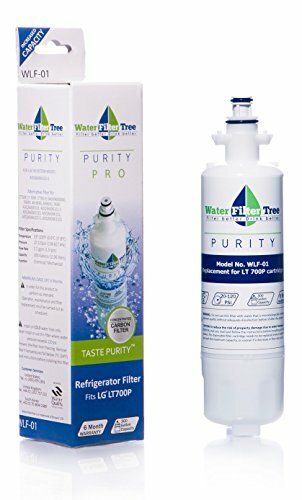 This filter is a direct replacement for the following refrigerator filter model numbers: LG IT700p, ADQ36006101, ADQ36006101-S, ADQ36006101S, ADQ36006102, ADQ36006102-S, adq36006102s, 048231783705, ADQ36006101, 9690, 46-9690. The science: Unlike most refrigerator filters that lose up to 58% filtration efficiency due to clogging, our unique concentrated coconut activated carbon refrigerator filters are mixed and compressed using advanced patented Celanese resin. With an atomic mass of 3 million, 10 million, this ultra high molecular weight polyethylene (UHMWPE) resin retains a much higher carbon surface area, increasing the components life and allowing more harmful contaminants to be removed from the water and bond to the carbon. Compared to refrigerator filters that use standard thermoplastic resin as a binding agent in the extruded process, our filters retain 98% filtration efficiency for the life span of the filter, making them one of the most efficient in the market.